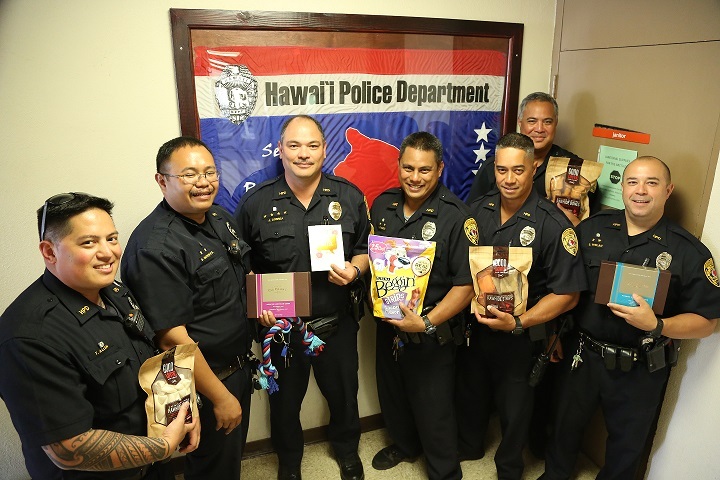 When Hawaiʻi Police Department officers learned that a Honolulu Police officer and his K-9 named Hunter were shot during a standoff on Oahu last month, they wanted to send them a get-well gift. Officers from the South Hilo Patrol Division collectively decided to put together a donation box in the squad room where officers contributed everything from chew toys, balls, and snacks for Hunter as well as a monetary gift and snacks for his handler. The carton of “aloha” was packed and hand carried by an off-duty officer to be handed over to a fellow officer with the Honolulu Police Department. “Having recently gone through a tragic loss of our own, it was a small way of demonstrating that all officers, even 4-legged officers, are part of our extended law enforcement ohana” said Captain Gregory Esteban, South Hilo Patrol Commander. “Our department experienced an incredible outpouring of support from the community and public safety officials locally, nationally, and internationally. These officers simply wanted to reciprocate with this small token and let them both know that they are in our thoughts and prayers and wish them a very speedy recovery.” Esteban added.